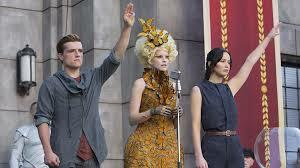 Catching Fire does include some elements that keeps it being too much like the first Hunger Games. NOTE: I know this is awfully late to post a review of Catching Fire but I’ve had another lack of ambition in terms of writing this year. Those of you who’ve been subscribed to my blog for more than a year will remember the six week gap that began after the Oscars and left me with a March of nothing. Fortunately this gap ends today. However it explains this review coming awfully late. I’m sure most of you have already seen The Hunger Games: Catching Fire. Heck, there are still people seeing it as it’s still in the Top 10 at the box office this weekend and about to pass the $400 million mark. In this review, I won’t focus too much on the nitty gritty as I normally do. However I will post my thoughts on it as I was watching. Being one who has not read the novels, I will have a lot to say from what I remember seeing. Those of you who have read my review of the original Hunger Games may have gotten a sense I did not read the novels. Especially since I made guesses about what was to happen in future movies. The funny thing is in the first movie, I thought the new love between Katniss and Peeta was real. I should have known Katniss did it for the sake of both of them winning. If it was a real relationship, why would boyfriend Gale applaud at the end? One thing about the ending of the first. It provides the catharsis for President Snow to visit Katniss and even threaten her. The funny thing about the beginning is that it tells the whole truth about Katniss’ love triangle. There’s Gale whom she truly loves. And there’s Peeta whom she faked love for the both of them winning but he truly loves her and is crushed with the truth. There’s also the whole Hunger Games charade. Champions have to tour year after year across the districts. That mean the Katniss/Peeta charade has to be kept alive. It’s not an easy thing to do as people see them as this thing and rebels are executed by militia. Even harder is Peeta adding to the charade by proposing marriage to Katniss. As one who hasn’t read the novel, the Quarter Quell came to me as a total surprise. Each year you have kids killing for the win and now you have winners killing each other off? I’m sure there were others who thought: “Not another Hunger Games. Twenty-four winners competing to be the one still alive? Why?” I was confused by it all, even though I was made aware that this was part of President Snow’s plan. I was also thinking is this was going to be your typical movie sequel where they rehash the elements of the original. The Quarter Quell does appear to be redundant as it involves a parade around the stadium and even the contestants introducing themselves to the crowd and showing off their costumes. Even the new high-tech training does appear to be a case of rehashing from the first. Having Heymitch back as their coach and Cinna back as their costumer didn’t make things that much fresher either. There was one new element. There’s Katniss interacting and even befriending some of the other contestants before the competition. Then comes the actual competition. There comes deadly rivalry from some of the contestants. There’s even potential fatality from some of the virtual effects created by the games masters. The way Katniss reaches out and befriends some of the other contestants is only slightly repetitive of the first but it does have its own original moments with her befriending of Mags, Wiress, Beetee and even the obnoxious Johanna. The Katniss/Peeta relationship in this movie had me on the untrusting side. It left me wondering if this was real or fake for the show again. Even the addition of Finnick leaves me wondering about the love triangle as I wondered is he really helping or is he trying to get a piece of Katniss? It isn’t until the very end of the movie that I learned that the real battle in this Hunger Games movie is not Katniss against the other competitors but actually Katniss against the whole Hunger Games institution. It was obvious she knew what President Snow was up to. It also gave Katniss a sense that the other contestants in the Quarter Quell were as much a victim of this whole Hunger Games system as she was. It was evident that they all wanted out and would be lucky to survive getting out. The ending of the movie left me with a lot of questions about what to expect for the final part of the trilogy. Make that ‘parts’ since the final novel will follow the examples of Harry Potter and Twilight and divide it into two movies. Way to go, Hollywood! Now onto the technical stuff. Jennifer Lawrence was good but not that spectacular. I’ll admit that I compared it to her Oscar-winning role of Silver Linings Playbook and it just doesn’t compare. It’s hard not to now! Josh Hutcherson turned Peeta from a lonely homely boy to a boy now angry and hurting. Sam Claflin helped make Finnick the one fresh character that added to the movie this time around. Actually the characters of the contestants of the Quarter Quell were all quite good in terms of both their characterizations and in making their characters human and likeable. The characters of those pulling the strings of the Hunger Games like Stanley Tucci’s Caesar and Elizabeth Banks’ Effie may have come across as irritating and stockish at times but they added to the story. Actually they added to the theme of the movie of how there are these cartoonish people pulling the strings of the show while the contestants are mostly the real 3D people in this game. Even though they have a show to put on and a game to kill for the win, they still feel and hurt. Now onto the technical stuff. Francis Lawrence did a good job of directing, even though there was nothing fresh added. Actually he’s slated to direct both Mockingjay movies. We’ll see how he works it. Once again I admit I’ve never read the novel so I can’t say how good of an adaptation Simon Beaufoy and Michael De Bruyn did. I will say that it did seem too much like the first. James Newton Howard did a very good job in terms of the score. The visual effects team did an excellent job with the effects. Trish Summerville did a very good job with the costumes. It’s unfortunate that the first movie’s costumes didn’t get an Oscar nomination. I shouldn’t be surprised since the Academy normally favors timepiece costuming over fantasy costuming. But is it deserving, even again here. The Hunger Games: Catching Fire is bound to get a lot of people who haven’t read the novel surprised, then questioning, then surprised and then guessing at the end what to expect next. The good thing about this movie is that even though there is some redundancy, it doesn’t resort to Twilight’s trick of focusing on hot guys. It knows it’s mostly about the drama and sticks to it. That’s the best thing and I hope they keep it up for the two Mockingjay movies.